Sunday 28 April - At 256 kilometres, Liège-Bastogne-Liège is a ceaseless onslaught in the Ardennes. Following a race with eleven sharp climbs the finale takes place on the wide Boulevard d’Avroy in the centre of Liège. After 27 years in the suburb of Ans, the finish of La Doyenne returns to the centre of Liège to remain there until at least 2024. So the race lives up to its name – Liège-Bastogne-Liège – for the first time in 27 years. A relatively flat opener runs to the Côte de La Roche-en-Ardenne and almost 30 kilometres later the riders are in Bastogne at the Rond-Point de la Doyenne, which is the halfway turn point. The route returns to Liège on much more demanding terrain. The Côte de Saint-Roch in Houffalize – 1 kilometre at 11.2% – gives a first taste of what’s in store before the route continues to the Côte de Mont-le-Soie. This is, at kilometre 161 and with almost 100 kilometres remaining, where the uphill onslaught really begins. Within 12 kilometres the riders tackle Côte de Wanne (2.7 kilometres at 7.4%), Côte de Stockeu (1 kilometre at 12.5%) and Côte de Haute-Levée (3.1 kilometres at 7%) before continuing to the Col du Rosier, which is the longest climb of the day: 4.4 kilometres at 5.9%. Still 50 kilometres to go. A long descent leads to the foot of the Col du Maquisard. The 2.5 kilometres climb at 5% is nothing compared to the Col de la Redoute. The emblematic hill amounts to 2 kilometres and its average gradient is 8.9%, while the steepest ramps are 13%. A short drop and an equally short climb lead to Sprimont before the short and sharp Côte des Forges appears. The Côte de Saint-Nicolas is removed from the finale, which makes the energy sapping Côte de la Roche- aux-Faucons (1.3 kilometres at 11%) the last climb. To pep things up the route continues uphill when the Roche-aux-Faucons peaks out, but eventually the riders drop down to a flat run-in to the line. Expect a select group sprint of exhausted men. 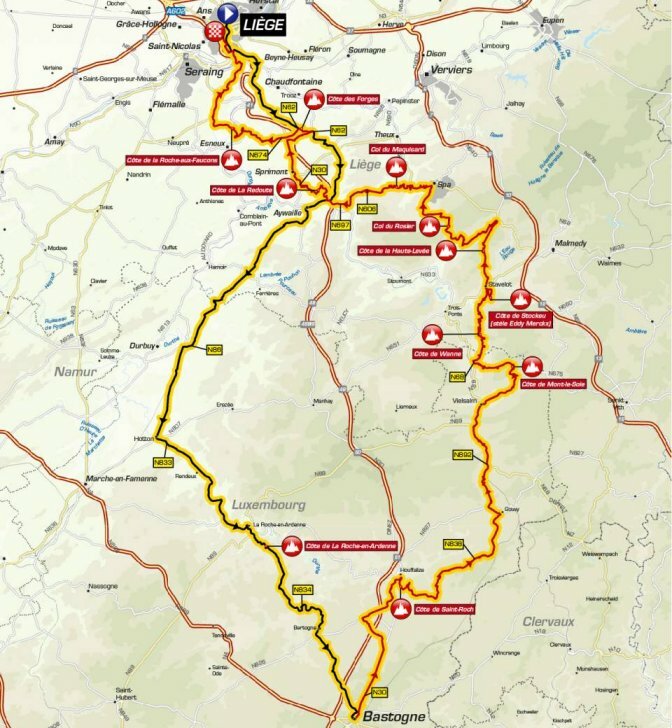 Liège-Bastogne-Liège starts at 10:00 on Place Saint-Lambert and the race is expected to finish around 15:45 on the Boulevard d’Avroy – both are local times. What time does the race start? roughly what time do the riders reach the Cote de la Roche-aux-Faucons? Where does the race start? Ans? Which street? Any chance there will be a big screen near the finish? Will be my 1st LBL. We updated the article. You’ll find the requested information underneath the text. Where exactly will the finish line be? What street? And importantly near which pub!! Boulevard d’Avroy. Enjoy the race. And the pubs!